Christian Media in Nigeria : Shekinah Nite holds its15th Anniversary on 12 Nov.
Shekinah Nite holds its15th Anniversary on 12 Nov. 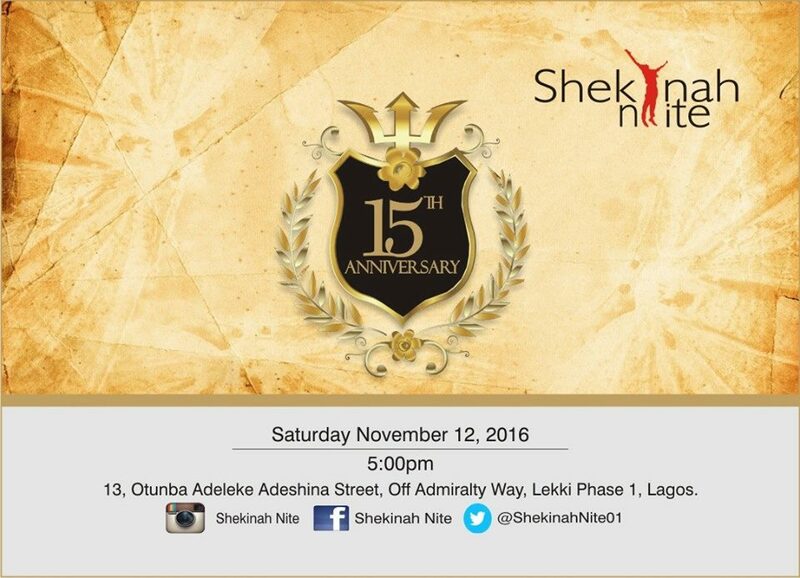 The promoters of Shekinah Nite, Alero and Agu Imo will be holding the 15th anniversary of Shekinah Nite today, 12th November 2016. Shekinah Nite is a monthly Christian musical event (2nd Sat) which presents Jesus Christ to a dark generation as the source of light and life utilising praise and worship! By the special grace of God, Shekinah Nite commenced in the month of November 2001. This month, we invite you to come and join us celebrate the goodness of God and the grace He has given to us to hold the event every single month without break! The event comes up on Saturday the 12th of November at #13, Otunba Adeleke Adeshina Street, Lekki Phase 1 at 5pm. Ministering will be some of the ministers who have been a part of this event for 15 uninterrupted years. May we therefore, anticipate your kind attendance along with your family and friends at this entirely free family friendly event. The venue is easily accessed from the Lekki/Ikoyi Bridge or the Lekki/ Épe Expressway at the first roundabout. From either, it is a straight drive down Admiralty Way past Prince Ebeano Supermarket and Tantalizers with a left turn at the 21st Century Junction into Babatunde Anjous, a first right thereafter into Jeremiah Ugwu and then a second left into Otunba Adeleke Adeshina Street. If you would rather, the option of comfortable transportation to and from the venue is provided at 4:30pm from our previous venue at 252, Murtala Muhammed Way, Yaba on the Mainland. Come and join us sing hallelujah!